Only the sound of paddles hitting the water breaks the silence when you paddle inward on Lake Langtjønna north of Lake Femunden. On both sides lies a sparse pine forest with low-growing heather and big boulders as far as the eye can see. Norway is known for its great hiking in the mountains above the tree line, but according to Statskog – the Norwegian state-owned land and forest enterprise – 43 percent of Norway’s land area is actually covered by forest and trees. What is not generally known is that these forests contain a number of shacks and huts which are like rustic monuments to centuries of forest management and other human activity. Some of them are severely marked by the ravages of time and only serve as uninhabitable relics and memories of a bygone age. But many are maintained and in good enough condition for you to be able to stay the night whilst on a trip amid the Norwegian nature. Statskog is Norway’s largest landowner and has around 130 open shacks and huts nationwide. You’ll find nearly 20 of them in the Langtjønna Landscape Conservation Area and in Femundsmarka National Park in the border area between the counties of Hedmark and Sør-Trøndelag. The fact that they are open means you can stay the night totally free of charge. “Up until the 1990s, this was basically a well-kept secret”, says Geir Wagnild. As Statskog’s property supervisor for operations and management in this area, Geir is very familiar with the terrain around the Femundsmarka wilderness area and the border country. It was thanks to the Internet that word about the “secret” spread more rapidly. As a result, Statskog decided to create a listing of the shelters on statsskog.no and godtur.no make them easier to find. In 1980, the mining town of Røros was inscribed on UNESCO’s World Heritage List. 333 years of mining and urban agriculture had created a totally unique city on the mountain plains. The mining town has preserved much of its original character with its street layout from the 1600s and the wooden houses from the 1700s and 1800s. In 2010, the World Heritage site was expanded to include the surrounding area, which is called the Circumference. The basis for doing so was the important testimony that the Circumference provides us about how mining operations transpired as well as how the inhabitants have adapted to the mountain terrain, local nature, and cold climate. The Statskog huts in Norway are located in both forests and mountains. The standard is very basic and often consists of wooden bunks to sleep on, and some huts only have a dirt floor. Sleeping capacity varies from two to fifteen people. The huts situated in the forest were probably originally used by loggers and log drivers, while others were built as hunting and fishing huts or set up in more recent times for hikers. “The ‘first come, first served’ principle applies, but you are obliged to yield when you have stayed there 24 hours and new guests arrive”, says Geir Wagnild. It is basically free to stay in the open huts. Everyone is welcome, and there is also information about how you can pay a voluntary amount if you want to do so. Many travellers have a visit to Røros high on their list of dream destinations. The Røros Copper Works was in operation for 333 years, and in 1980 the mining town of Røros ended up on the UNESCO list of World Cultural and Natural Heritage sites. Already in 1646, Christian IV, who was King of the Dano-Norwegian Union, granted Røros Copper Works exclusive rights to the natural resources within a circumference with a radius of approximately 44 kilometres. According to Bergstaden.org (only in Norwegian), these extraction rights applied to all ore deposits in the area, and the right to use the forests for purposes including fuel in the mines and the smelteries. If you paddle from Synnervika all the way north in Femunden, and continue into Nordvika and via Langtjønna lake towards Feragen, you end up in the middle of the impressive UNESCO World Heritage site. According to the Røros Museum and Historical Society, the Røros Copper Works was quick to take an interest in the forest resources along Femunden. Already in 1688, the first plans appeared for the construction of logging canals that made it possible to drive wood and timber from Femunden through the Langtjønna waterway and on to the Hådal waterway, which ends in Røros. The work was first begun in 1714 and completed in 1766, and the log driving facilities between Femunden and Faragen now consist of a total of four timber runs. If there is enough water, you can pass through by canoe; if not, the canoe must be carried over land. Please note that the canoe can get stuck sideways, and then all of your stuff will get wet. The log drivers lived under miserable conditions for a long while in the Femundsmarka wilderness area, but a number of log driver huts were erected in the end of the 1800s. One of them was the hut Langtjønnbua, which was built in the 1890s, and which you now have the opportunity to stay in. “We primarily do restorations to protect the historical cultural structures, and outdoor enthusiasts get to benefit from this as well”, says Geir Wagnild. It was in 1936 that ownership of the Femundsmarka wilderness area was conferred by the Røros Copper Works to the Norwegian state as part of their debt restructuring, says Geir. Statskog works closely with the Directorate for National Park Management as well as the Directorate for Cultural Heritage with regards to the conservation of selected buildings owned by Statskog. Eight of these structures are located in Røros municipality, and you can visit seven of them in the Langtjønna Landscape Conservation Area and in Femundsmarka National Park, including the huts named Furubakken, Langtjønnbua, Litjrennbua and Lortholbua. 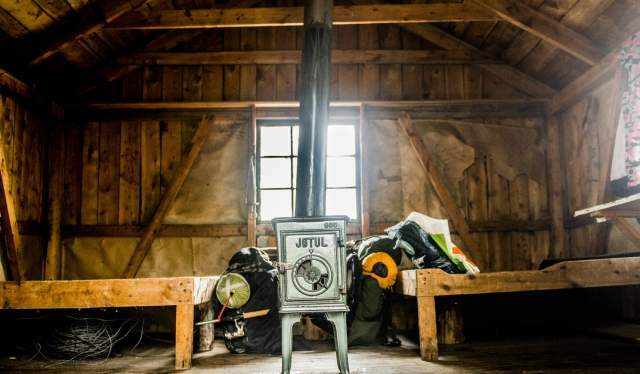 “The huts tell the story of what was needed at different spots in the forest”, explains Geir. “The huts have wood-burning stoves, and Statskog and the Norwegian Nature Inspectorate (SNO) transport in firewood”, says Geir Wagnild. The main rule is that you clean up after yourself, carry in firewood for the next visitor, and take your garbage with you. Geir stresses that you cannot assume that a hut is vacant, as there may be a huge demand. You might also find yourself needing to share the huts with other people. “Everyone should bring along a tent as an alternative form of accommodation”, he says. “It is our first night sleeping in a free hut. It looks very promising, but the sleeping pad is thin, and it can be a little hard to sleep on wooden bunks”, laughs Eric van der Munnik. He is on a 20-day hiking trip in Femundsmarka together with Lody Teewen. Now, they’re going to sleep in the Langtjønnbua Hut – the oldest of the log driver huts in this part of the forest. “The cabins are a fantastic option, and I like the idea that they’re free. I hope people treat them well, and leave them as they find them”, says Lody Teewen. “You're out, we’re in”, says Geir Wagnild slyly before going into the Ljørbua hut. “It means ‘you guys leave, we’re coming in now’”, and Geir says the same thing no matter which hut he is entering. It is an old superstition to give a message to the little people or gnomes who would watch over the huts that people were now arriving. 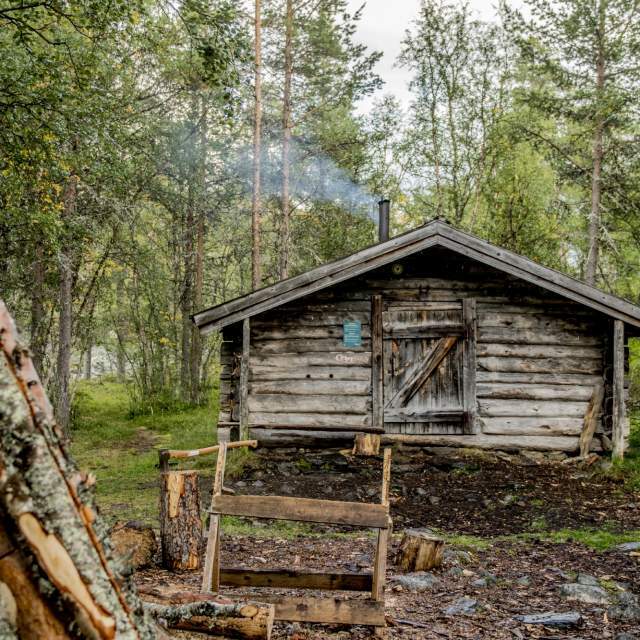 In the forests around Femunden, most of the open huts are connected to the log driving, but you will also find huts related to working the pastures along with hunting and fishing, and reindeer herding. Ljørbua hut or Jælet-bua hut, is an old haymaker’s hut from around 1830, says Geir Wagnild and Arne Langen from Langen Guest House. Guests have carved their names into the hut walls in Femundsmarka for generations. In Jælet-bua, the oldest name-carving is from 1843. Here you can live the good life with wooden benches, dirt floor, turf roof, and an open fireplace in the middle. “The Ljørbuene huts are small log cabins with open fireplaces and hatch in the roofs, called a ‘ljore’, which you can lift off, hence the Norwegian name. This is one of the oldest huts still standing today”, says Geir. If you want to paddle along the historic waterways in the Femundsmarka wilderness area and the Langtjønna Landscape Conservation Area, it’s no problem to go it on your own. If you need to rent a canoe and equipment, you can contact the Langen Guest House, amongst others. Arne Langen is the tenth generation at the Langen Farm, and fifth generation at Langen Guest House, which combines farming and tourism. “After the ferry boat was put in operation on Femunden in 1886, the government set up transport stations. Langen Farm was a transport station in 1887 in exchange for an annual compensation”, says Arne. Langen Guest House was established in 1920, and Arne currently runs the tourist operation together with his wife, Monica Langen. As long as you conduct yourself considerately and carefully, the public right of access gives you the right to move about in Norway’s outlying areas all year round. The term ‘outlying areas’ refers to land that is not being used for agricultural purposes. You can pick flowers and forage for plants, berries, mushrooms and roots of wild herbs to take home or even pick nuts if you eat them on site. There are special rules controlling the picking of cloudberries in Nordland, Troms and Finnmark counties. This right does not encompass hunting or fishing in freshwater bodies, but everyone is allowed to fish in freshwater where fishing permits are issued. You can fish for free in saltwater throughout the year for private consumption. You can pitch a tent anywhere you like, as long as you maintain a minimum distance of 150 metres from the nearest occupied residence or cabin. You must ask for the landowner’s permission if you intend to stay the night at the same location for more than two days. This does not apply to the high mountains or locations far away from inhabited areas. More information about the right to roam. Whether you travel by land or on the water in Femunden’s vast forests, it doesn’t take long before you find tranquillity in the authentic Norwegian wilderness. For, even if you happen upon traces of human activity dating from hundreds of years, you are still far away from people. The wolverine inhabits this area, and a bear will occasionally pass by. If you are extra lucky, you might see the little Swedish-Norwegian musk ox herd that sometimes comes through here. However, it is more likely that you will get to see ducks, beaver, or that a golden eagle will circle above you high up in the sky. Or maybe you will encounter a moose or one of the many thousands of domesticated reindeer that live far inside the enchanting forest much of the year. Be sure to bring a fishing rod in your pack – beneath the surface there are trout, char, grayling, perch and pike hiding. When darkness settles around the pine trunks, it is good to feel the warmth from the fire. It is easy to be seduced by the dancing flames, but you must not forget to gaze at the stars now and then. Sometimes you can even get to experience the Northern Light’s bewitching dance in Femunden, which takes you into the night.